NICHOLAS YEO/AFP/Getty ImagesThe pungent smell of rotting durian was mistaken for a gas leak at an Australian university. An Australian university library was evacuated on Saturday over a suspected gas leak that turned out to be the smell of a rotting durian. 500 people were evacuated after the pungent smell travelled through the air-conditioning system. 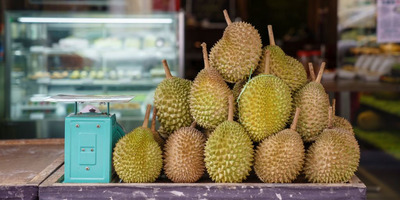 Durian is the world’s smelliest fruit and is banned in taxis and hotels throughout Asia. An Australian university library was evacuated after a rotting fruit was mistaken for a gas leak. Firefighters arrived at the campus of RMIT in Melbourne’s CBD around 3 p.m. on Saturday after receiving a call about a suspected gas leak. As a precautionary measure, police evacuated approximately 500 students and teachers. In a statement entitled “Rotten afternoon on campus,” the Metropolitan Fire Brigade described how it conducted a “comprehensive search,” eventually discovering the smell was not a chemical gas but rather the gas emitted from a rotting durian fruit. The spiky fruit, which has an incredibly pungent smell, had been left rotting in a cupboard, according to the statement. The smell travelled through the building’s air-conditioning system. The custardy flesh inside a durian is an acquired taste, with a sweet flavour to some eaters that others find completely unpalatable. As one of the world’s smelliest fruits, durian is forbidden in many taxis and hotels throughout Asia. Singapore’s public transport system has banned the fruit entirely.